There are single and twin jointed iron staffs, soft and hard. The nine-joint staff is one of soft weapons in Wushu. This staff consists of a dart head, a handle, and iron joints connected by rings. The length of the staff is usually below the head of the user. In the book of Weapon History in China it says that “The iron staff has many joints and originated in the Jin Dynasty (265-420)” The soft staff was a powerful hidden weapon, which“can inflict serious wounds and which you can hardly resist in the ancient battlefields.” Once the staff is unleashed, it could hit, flog, hook and bind the opponent and staff masters could even beat those who used sword and sabre. There are seven-joint, nine-joint and 13-joint staffs. 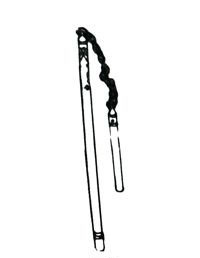 The staff is very easy to carry with and could be held in the hand or put around the waist. The movements of the nine-joint staff play in Wushu include tying, swinging, sweeping, hanging, throwing and dancing with flower patterns. Tying means to tip up the hands, elbows, shoulders, neck, waist and legs of the opponent by various forms. Swinging means to wave the staff so that it moves fast in a vertical circle. Sweeping means to wave the staff so that it moves fast in a flat circle. Hanging means to add force to a certain section of the fast-moving staff or to change the direction of its movement. Throwing means to throw the fast-moving staff into the air. Staff-dancing includes single and double hand plays. In single hand play the staff is to move in vertical circles in front of or behind the body. In double hand plays, the staff moves in vertical circles on both sides of the body. From the above descriptions we can see that the nine-joint staff moves mainly in circles by relying on the waving of the arms and the turning of the body to exert force to a certain part of it to increase its movement and change the center and direction of the circle. The soft staffs include single staff and double staffs. They can be used together with the saber. In paired practice the nine-section staff is used against the spear. The hard staff is a short weapon. There are two types-one is the joint steel staff which looks like a bamboo stick, and the other is the 13-joint steel staff. This meter-long staff has 13 joints, not including the handle which is about 44 mm in diameter. There are 13 or 14 square knots on the body of the staff. The head of the staff is thinner with a blunt tip and the handle, made of wood or iron, is at the bottom. The main uses include stroking, beating, digging, hanging, poking, cutting, seal ing, shutting, fending, blocking, wrestling, dropping, pointing, coiling and sweeping.